Presumably invented to justify the existence of ‘social media consultants’ and their ilk, QR codes are both essentially pointless and inescapably awesome. You can simply point your QR-enabled phone at one and be magically transported to a web address of the creator’s choosing. IT’S LIKE TYPING IN A URL WITH NO HANDS!! 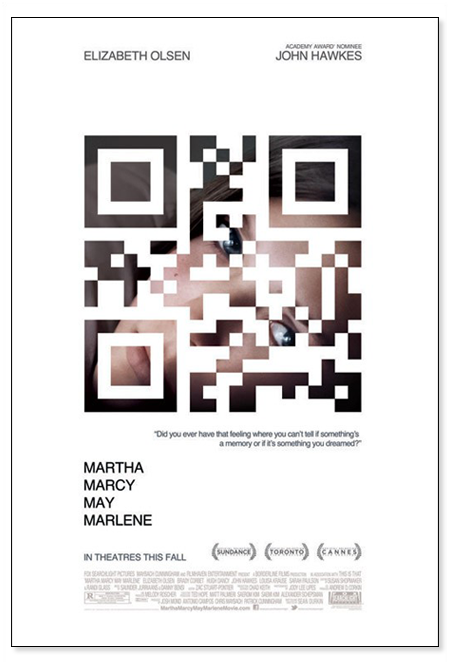 The QR code on this poster for Martha Marcy May Marlene re-directs to http://is.gd/jPudSV, a shortened URL that leads to a teaser trailer for the film. Unfortunately for Fox Searchlight, some QR readers (including mine) are not case-sensitive and will instead point users to http://is.gd/jpudsv, a link that until an hour ago led nowhere. I say ‘until an hour ago’ because one of my hee-larious Twitter followers has now pointed it at the ‘Human feces’ Wikipedia entry.